You do not need to have the taste of an art critic or the knowledge of an historian in order to appreciate the beauty of the neon memories on display at the American Sign Museum in Walnut Hills. The museum is filled to the brim with historic signs that in their own way act as shimmering archives of Cincinnati’s past, providing us with an unwritten narrative of our own history. The museum, hidden in Walnut Hills, opened its doors in 2005 and is the only public sign museum in the country. The space currently houses some 3,800 signs and pieces of memorabilia, some dating back to the late 19th century. It is, however, not always the objects themselves that provide the real attraction. ”We, of course, like to have the signs in the museum, but it’s as or sometimes more important to know the story behind them…they have more meaning that way,” said founder and museum director Tod Swormstedt. 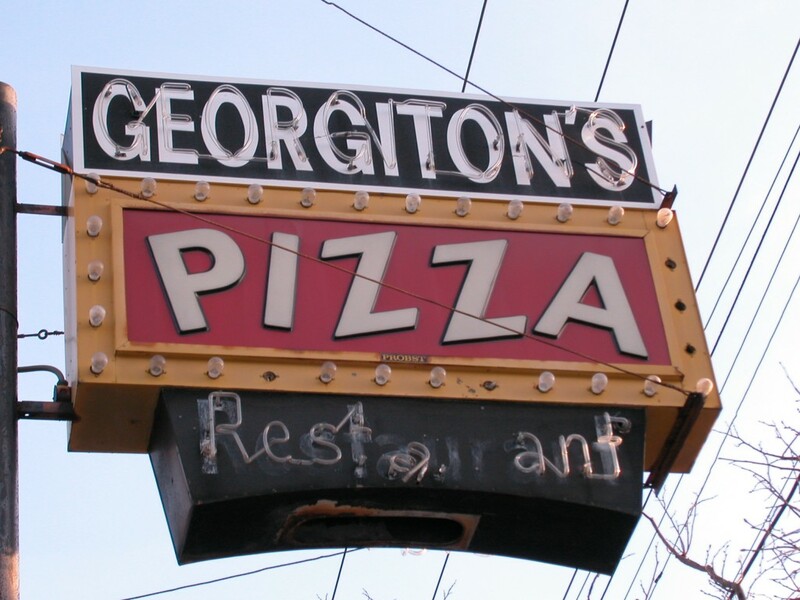 One such example Swormstedt points to is the story surrounding an old Georgiton’s Pizza sign that last stood in the back parking lot of Mac’s Pizza Pub in Clifton Heights. According to Swormstedt, soon after opening his restaurant/bar Mac renovated his back parking lot and brought down the old sign. He decided that it would be best to donate it to Swormstedt’s collection, and as the sign was brought down from its metal post a bit of history was, literally, uncovered. Once viewed up close it was apparent that Georgiton’s Pizza had simply been carved into sheet metal and layered over an older Papa Dino’s sign. After some investigating, it was discovered that two brothers had once operated Papa Dino’s out of the building that now houses Mac’s Pizza Pub. The brothers eventually had a falling out that caused them to split up and form rival pizza restaurants. While one left and took the name Papa Dino’s just one block north to Calhoun Street, the other stayed and simply changed the name on the sign to Georgiton’s Pizza. 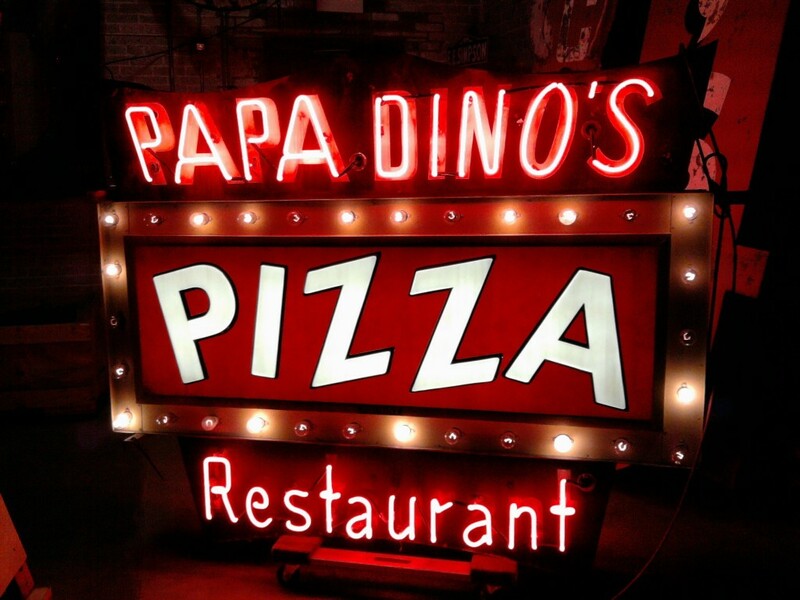 Today, Papa Dino’s is still in business at the corner of Calhoun Street and Clifton Avenue, and although Georgiton’s Pizza is now just a memory, we still have two great pizza joints within one block of each other in Clifton. 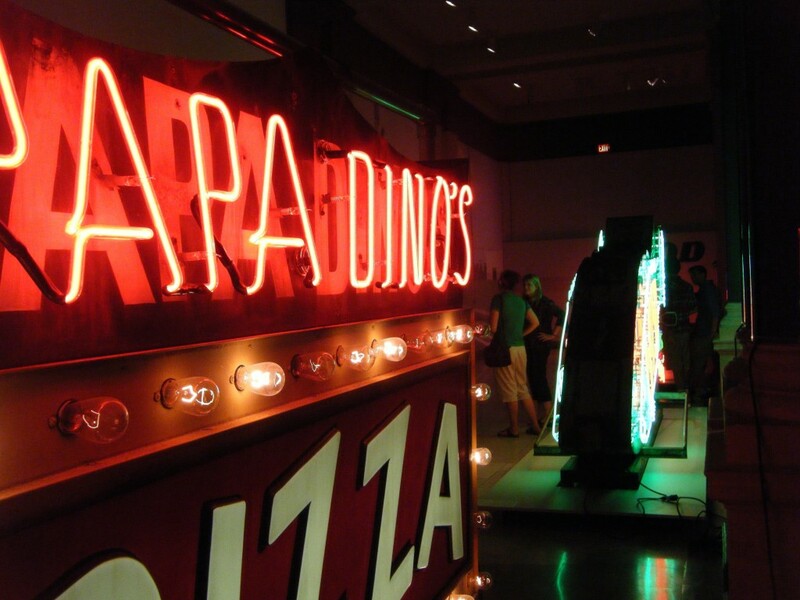 You can currently view the Papa Dino’s/Georgiton’s Pizza sign and its story at the Cincinnati Art Museum. It is part of their Artworks: The American Road series that runs through August 29th. The American Sign Museum is located at 2515 Essex Place in Walnut Hills and is open to the public on Saturdays from 10am to 4pm. All other times must be scheduled by appointment by (513) 258-4020 or tod@signmuseum.org.